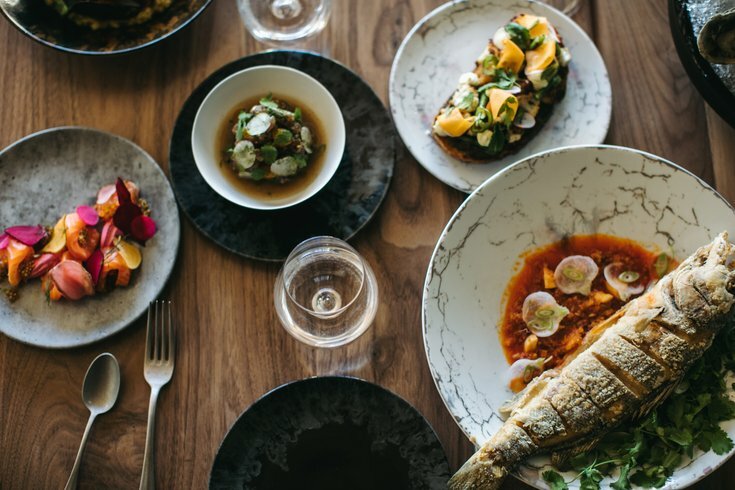 The restaurant team behind Mistral KOP, Mistral Princeton & Elements Princeton are opening their first seafood-centric concept, Aether. Aether will open on Frankford Avenue in Fishtown on Thursday. The new seafood restaurant comes from the culinary team behind New Jersey's Elements and Mistral. Opening day through the end of March, which is Women's History Month, Aether will donate a portion of proceeds to Women Against Abuse. The nonprofit agency is Philadelphia's leading domestic violence organization. The restaurant will serve a selection of seafood dishes, including lobster rolls, shrimp po’ boys and whole branzino, as well as handmade pasta and signature plates like the dry-aged burger with bacon jam. The raw bar will feature a rotating selection of oysters, live scallops, razor clams and more. "We will have $2 Little Neck clams and $3 oysters year-round, seafood towers starting as low as $60, $11 small plates and $16 pastas," explained Fia Berisha, co-owner of Aether. The restaurant will source fresh produce from Riverwards Produce, seafood from True World Foods and breads from Lost Bread Co. The restaurant's hours are listed below. Address is 1832 Frankford Avenue. • Tuesday through Thursday: 4:30-10 p.m.
• Friday and Saturday: 4:30-11 p.m. The bar will stay open until 1 a.m.